Sometimes you just need to eat your feelings. You get me? 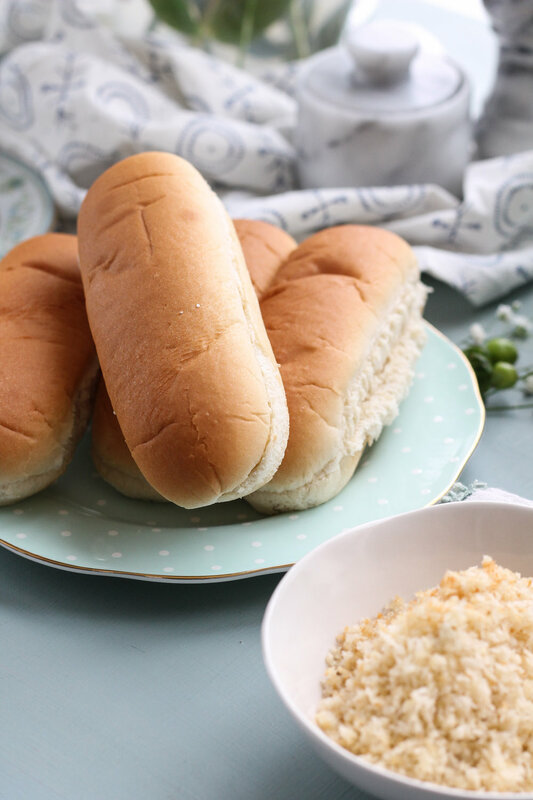 My feelings, which are all too often nostalgic in nature, told me to relive a childhood memory by way of deep indulgence, and I firmly believe in listening to feelings where carbs incased in more carbs are concerned. Truth be told, Mr. Pedantic and I were driving home from church one Sunday afternoon and I was starving, as per usual, and listing off all the many things I was simply dying to eat (also as per usual). Somewhere in my list of things I absolutely needed, I interrupted my own monologue to ask Mr. Pedantic whether his adolescence had ever included macaroni and cheese with hot dogs. Growing up, it was our "babysitter dinner" - the dinner my mother would prepare if she and our father were going out. I am sure I had not given the tired, uncomplicated combo a thought in at least a decade, but in that moment of intense hunger, nothing sounded better. Mr. Pedantic suggested that I give that memory my typical fancy pants treatment and concoct a "macaroni and cheese dog," and thus this dreamy meal was born. Oh, such good things are happening here. 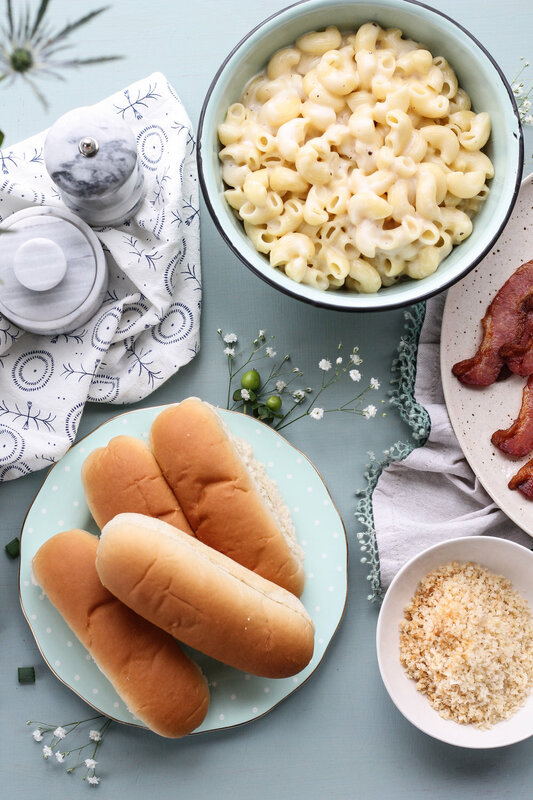 Of course the boxed macaroni and cheese of my childhood was exchanged for a far more rich white cheddar/gruyere homemade version, and Oscar Meyer was traded out for my favorite grass-fed all-natural beef hot dogs. Oh, but that is not all. I always cook my bacon in the oven, and in a moment of multitasking, I stumbled upon genius. I laid my bacon rashers out onto a cooling rack (the kind that stand up several inches) set over a lined sheet pan. As you probably guessed, the hot dogs were laid on that sheet pan to sizzle in the fat that slowly dripped from the bacon cooking above. After the dogs were cooked and the buns met with their steam bath, it was time to assemble. Bacon and toasted panko added an extra dose of texture. Green onions for color and crunch. I wish all memories tasted this good. Just don't try to eat this neatly; it's a losing game. Line a baking sheet with aluminum foil and lay the hot dogs out evenly across the pan. Set a stand-up cooling rack over the hot dogs (the cooling rack should not touch the dogs) and lay the bacon out over the rack. Cook until the bacon is crisp and the hot dogs are sizzling; about 15-20 minutes. While the hot dogs are cooking, prepare the macaroni and cheese. Recipe makes enough for hot dogs plus extra for sides. Fill a 4-quart saucepan 3/4-way with water and salt liberally. Set over high heat and bring to a boil. Add pasta and boil for 10 minutes, or until the pasta is al dente. While the pasta is cooking, prepare the cheese sauce. Place butter in a 3-quart saucepan and melt over medium heat. Add flour and whisk to form a paste. Cook, stirring constantly, for 1-2 minutes; until the roux is golden. Season with salt and nutmeg, then slowly whisk in milk. While whisking constantly, bring the mixture to a simmer and allow to thicken slightly. Remove from heat and whisk in cheeses. Fold the drained, cooked pasta into the cheese sauce and allow to cool slightly while you prepare the remaining elements. Place butter in a small frying pan and set over medium high heat. Once the butter has melted, add the panko. Toast, stirring constantly, until the crumbs are deep golden; 2-3 minutes. Fill a small saucepan with one inch of water and bring to a simmer over medium heat. Set a fine mesh strainer over the saucepan and lay the hot dog buns in the strainer. Steam, flipping the buns halfway through, for 3 minutes. 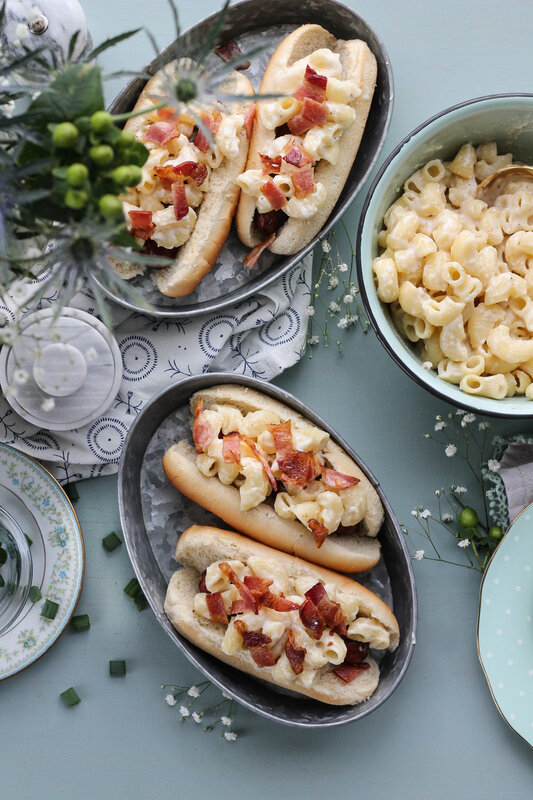 Lay the cooked hot dogs in the steamed buns and top with macaroni and cheese, toasted panko, crumbled bacon, and diced green onions. Serve immediately. Enjoy! !